Seven persons reportedly died while eight others sustained varying degrees of injury in a multiple auto crash involving three vehicles and 26 travellers, including drivers. The incident occurred around 5.30am on Saturday at Olorunpodo, J3, Sagamu-Ijebu Ode expressway. Traffic report indicated that the driver of a DAF truck with the number plate KRD 908 XN caused the accident by driving against traffic. 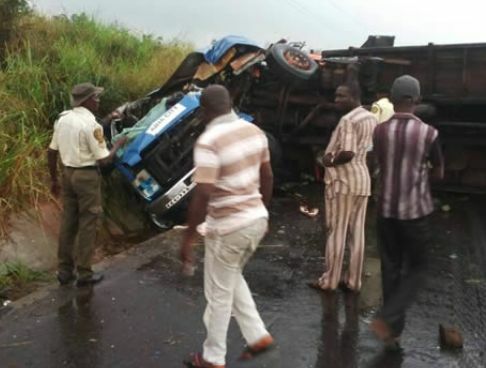 The DAF truck, which was coming from the Benin end of the expressway, was reported to have had a head-on collision with a Ford commercial bus with the number plate ETU 409 XA, travelling towards Benin, resulting to deaths of some passengers in the bus, while others were injured. The Ogun State Sector Commander, Federal Road Safety Corps, Clement Oladele, who confirmed the incident, said another vehicle later ran into the two vehicles at the scene. “A total of 26 people were involved, with 8 people injured while seven others died in the crash. The crash involved three vehicles – A Ford commercial bus and two trucks. “The driver of one of the trucks drove against traffic and had a head-on collision with the Ford commercial bus coming on its own lane. The other truck ran into the vehicles at the scene of the accident."